At First Point Fire & Safety, we are more than just experts in the field of fire safety and first aid. We provide a personal and friendly service with a professional attitude. We are a family run business so you can rest assured that you will be receiving a very personal and tailor-made service to suit your company’s needs. It doesn’t matter whether you are a residential or commercial client, we will offer the same level of our expertise to each of our customers personal requirements. Our goal is to provide each of our customers with a competitive rate without jeopardizing the quality of goods or service. 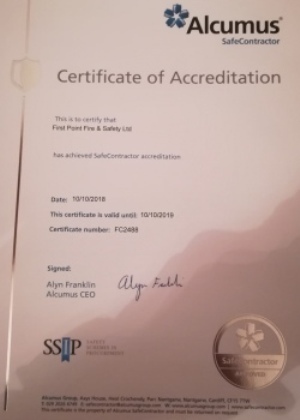 The Managing Director at First Point Fire and Safety, Colin Greensill, has worked within the Fire Safety industry for over 25 years, from a small company to a major blue chip organization and also served as a Fire Fighter for South Staffordshire Fire and Rescue Service. Over this period of time he has gained a vast amount of knowledge, so when it comes to protection and safety, it is at the very heart of our company. He has witnessed and understands only too well the devastation of fire from first-hand experience and wishes to promote ourselves to take the safety of your company, staff and assets into our hands. 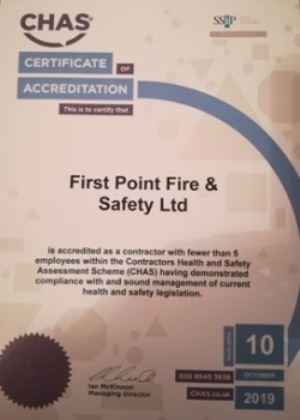 First Point Fire & Safety Ltd offer everything from free friendly advise to providing you with the correct equipment, knowledge and service to be compliant, from signage to putting your assembly point in the correct place. As Health and Safety laws grow increasingly complicated, we make it easy for you to comply with legislation. We provide products which ensure compliance and we’re always on hand to answer any questions and queries you may encounter, no matter how minor it may seem, we will always be happy to offer you free advice. We look forward to hearing from you here at First Point Fire and Safety, where your protection is paramount! Walsall, Sutton Coldfield, Birmingham, Coventry, Solihull, Dudley, Wolverhampton, West Bromwich, Kidderminster, Bromsgrove, Redditch, Stafford, Stoke-on-Trent, Cannock, Burton upon Trent, Lichfield, Tamworth, Shrewsbury, Telford, Nuneaton, Leicester, Nottingham, Loughborough and Melton Mowbray.